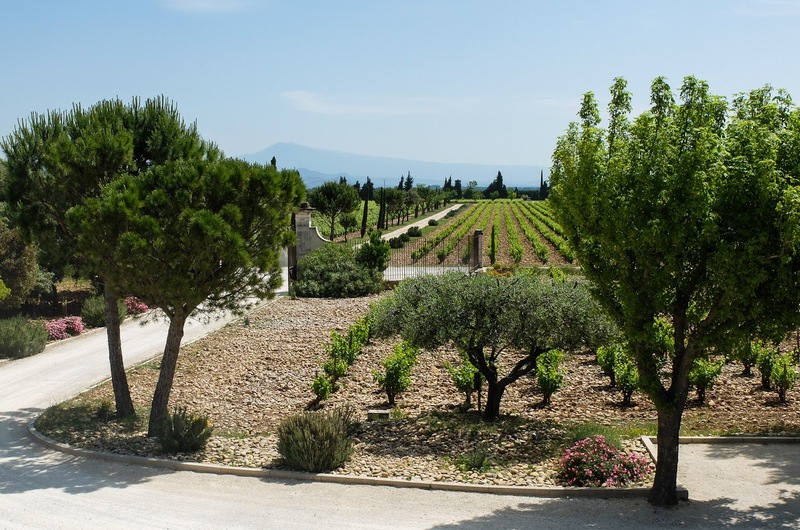 If you had the choice of visiting any of the iconic Southern Rhone vineyards, Beaucastel would surely be close to- if not at the top of- your list. It certainly was mine and if I didn’t feel lucky enough already waking to a bright and sunny morning in May then hearing that they only accept a few private visitors each year only served to emphasis my bonhomie. 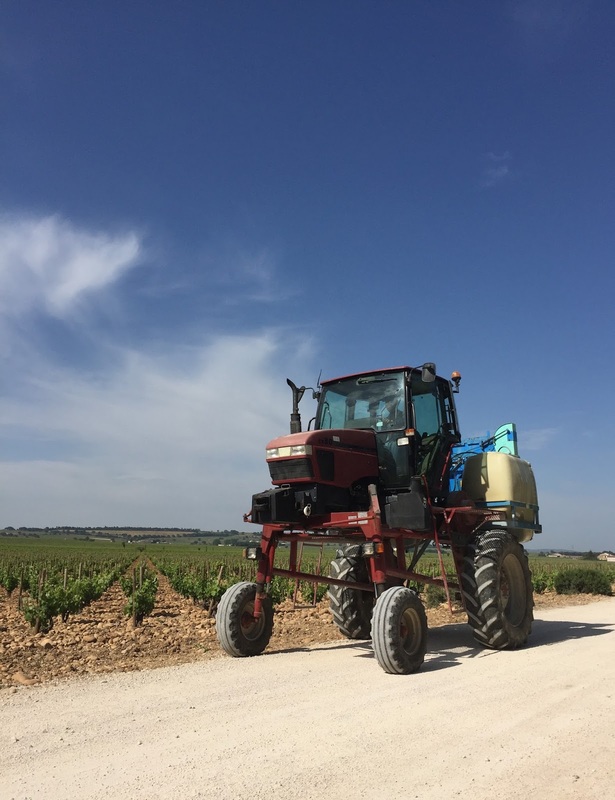 As we bumped down the lengthy drive past field after field of perfectly regimented vines (2m by 2m apart in case you are interested), our path was temporarily blocked by what looked like a tractor on steroids- wheels high above the ground. A standard weapon in the Beaucastel arsenal against weather, disease and the myriad of other trials sent to test beleaguered winemakers. Storms have been predicted for the next couple of days so it’s important to get the treatment spray on and kicking in before the rains come and risk disease or rot. 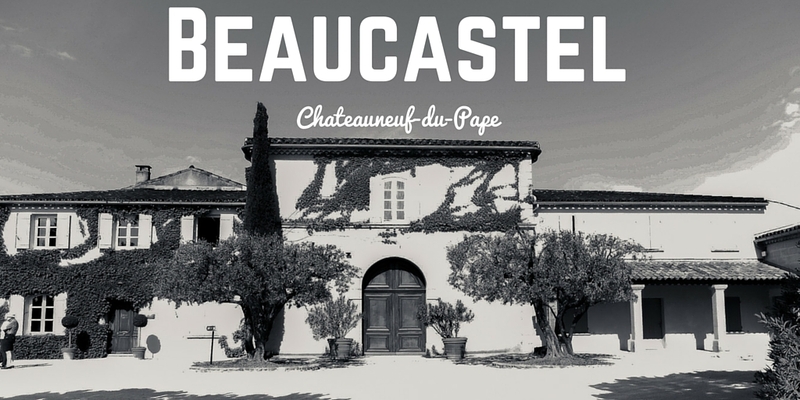 Beaucastel sprays the vines between 3-5 times per year depending on need. This rush to spray might sound as though they are averse to rain but in a region that averages only 700mm per year, rain is welcome, especially in spring to fill up the water table before the searing heat of summer sets in. In 2015 the temperature stuck between 35-40c from the end of June to the end of August resulting in a fantastic harvest and what is promising to be a great vintage. This kind of weather makes it imperative to a reservoir of water deep down into the roots as early on as possible. Our visit really did constitute ‘early on’. 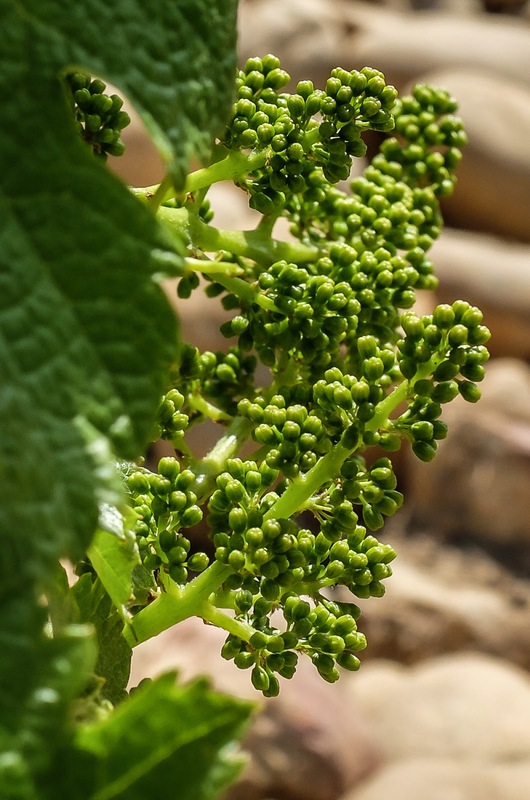 The Counoise planted adjacent to the winery had just undergone flowering with tiny berries beginning to form. 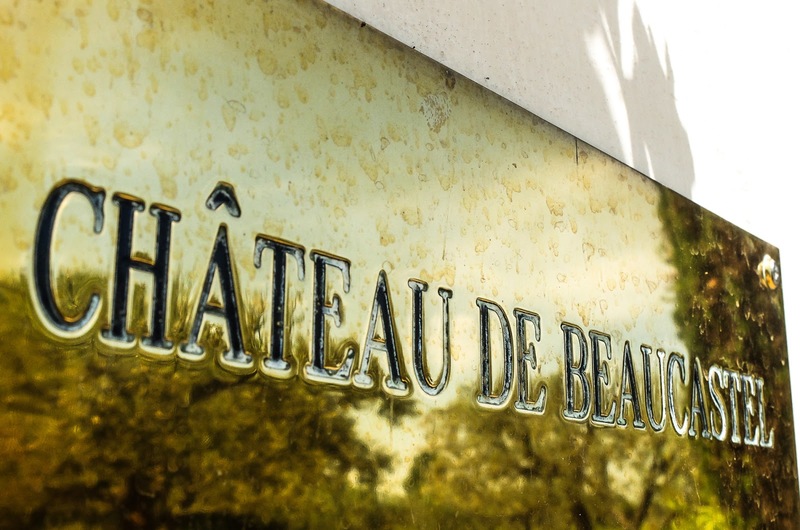 Beaucastel is somewhat unusual in that it is one of the only chateaux to use all of the approved Chateauneuf du Pape grapes leading to a wide variety of activity required throughout the season on the different varietals. This is all a long way from the 17th century origins of the original Chateau and estate. 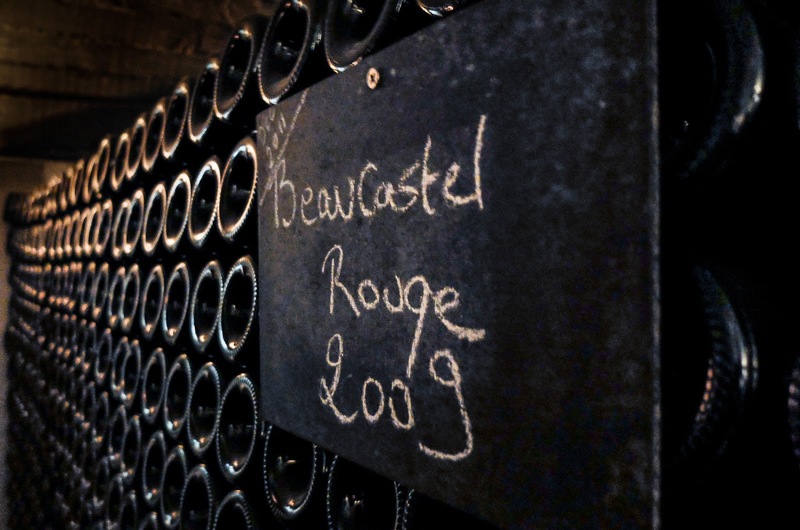 Beaucastel is a legend in Chateauneuf du Pape, mainly for its high quality wines but also for its history and location. Presented to Pierre de Beaucastel in 1687 by King Louis XIV as a reward for becoming Catholic in a region torn about by religious feuding, the estate has never been broken up; something of a miracle in a country where inheritance laws have seen vineyard after vineyard torn into little strips. The Perrin family purchased in 1909 shortly after the ravages of phylloxera and replanted the vines. In the 1950s Jacques Perrin took the then-visionary step of turning the vineyard organic- although Beaucastel is not Biodynamic now, it is something they are trialling in some parts of the vineyard and the environmental side of winemaking is clearly something that they remain passionate about. The vines adjacent to the main winery are all in the pudding stone “galet roulés” that the former Rhone river basin is so well known for. Heating up during the day and then protecting the vine at night with residual warmth- sometimes a little too effectively. Maintaining the galets is a very labour intensive operation. When weeding takes place each stone is removed by hand, the vine tended and then the stone replaced. Something of a gargantuan task when you think that there are over 250,000 vines. There are 40 full time employees devoted to vines that can be up to 60 years in age. This number increases to some 120 at harvest time. White grapes are picked first ending up with Mourvedre at the end trailing behind into early-mid October. Two runs at sorting the grapes are followed by entry into the destemmer (above). They then enter into the juicer (below), before the free run juice is flash heated. I didn’t know a whole lot about thermovinification before visiting Beaucastel but this seems like a good online summary courtesy of winesandvines.com In essence it can aid colour and flavour extraction as well as protecting the resulting wine from disease and pests. Our guide also suggested that it can assist in a wine maturing more quickly. Geeky pictures of wine machinery, sorry…. The grape varieties more prone to being reductive such as Syrah and Mourvedre go into barrels to ensure that they get access to more oxygen whilst the less reductive types are pumped over in cement tanks. The red wines spend 18 months in large oak barrels each of which are used for 15-20 years. The wines then undergo malolactic fermentation before being blended and aged for a further year in cask before bottling. 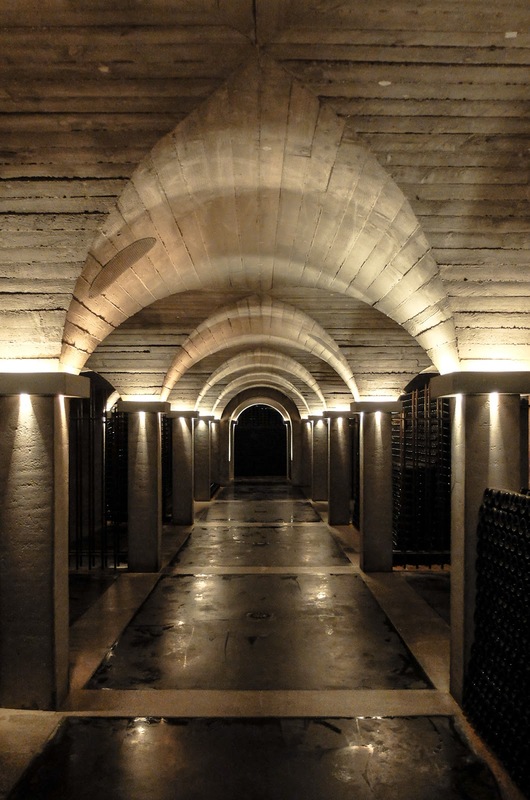 The foudres are 50,000 euros each and in 2015 nine were purchased giving a tiny indication of some of the overheads leading to the price tags on Beaucastel wines. Needless to say every nook and cranny of the winery is spotlessly clean. White wines are kept 30% in oak and 70% in tanks to ensure that the oak character of the wine remains subtle. The Vieilles Vines Chateauneuf du Pape is the winery’s top white wine made from 100% Roussanne old vines. The cellar is, of course, a thing of beauty. Hundreds of thousands of bottles lined carefully in the dark and dank storage rooms under the winery. An inventory is carried out every month which must be a trial for those involved. Around 80% of each bottled vintage is exported or sold within France. The remainder is divided between the family and used for tasting and marketing purposes as well as keeping a long term cellar inventory for future use and for supplying older vintages directly to selected restaurants. After an hour of immersing myself into how beautiful Beaucastel came into being, it was time for the tasting room. More on that later….